This volume sits at the cross-roads of a number of areas of scientific interest that, in the past, have largely kept themselves separate - agriculture, forestry, population genetics, ecology, conservation biology, genomics and the protection of plant genetic resources. Yet these areas also have a lot of common interests and increasingly these independent lines of inquiry are tending to coalesce into a more comprehensive view of the complexity of plant-pathogen associations and their ecological and evolutionary dynamics. 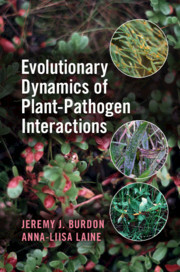 This interdisciplinary source provides a comprehensive overview of this changing situation by identifying the role of pathogens in shaping plant populations, species and communities, tackling the issue of the increasing importance of invasive and newly emerging diseases and giving broader recognition to the fundamental importance of the influence of space and time (as manifest in the metapopulation concept) in driving epidemiological and co-evolutionary trajectories. Preface; 1. The diverse and ubiquitous nature of pathogens; 2. Environment as a determinant of pathogen incidence, abundance and evolution; 3. Genetics of host plant resistance and pathogen infectivity and aggressiveness; 4. Sources and patterns of variation in plant pathogens; 5. Demographic and genetic processes in host and pathogen populations; 6. Co-evolutionary dynamics in a metapopulation context; 7. Co-evolution and host and pathogen life-histories; 8. Effect of pathogens on plant community dynamics; 9. Future developments. Jeremy J. Burdon is an Honorary Research Fellow in CSIRO (The Commonwealth Scientific and Industrial Research Organisation, Australia), having formerly retired in 2015, but is still actively involved in various projects in Australia, China, and Sweden. He was Chief of the CSIRO Division of Plant Industry during his career. His research has led to an understanding of the co-evolution of plants and their pathogens through integrated analysis of agricultural and natural ecosystems. He has served on numerous editorial boards, for journals such as: Euphytica, Oecologia, Ecology Letters, and the Journal of Ecology. His research has also been recognised through a number of awards and honorary positions. Anna-Liisa Laine is Professor of Ecology at the University of Zürich, Switzerland and a visiting Professor at the University of Helsinki, Finland. She is the Director of the Research Centre for Ecological Change and Vice-president of the European Society of Evolutionary Biology. She has served on several editorial boards including Evolution, Oikos, and New Phytologist. Her research combines epidemiological, experimental, and molecular approaches to understand how co-evolutionary feedback loops drive species interactions. She has received several awards for her research including the Academy of Finland's Science award and the L'Oreal-UNESCO award for Women in Science.